In the past few weeks, Japanese players have had the chance to try out Dark Souls 3 before release thanks to a few special events. Another one of these events has been held this weekend and details from the event have surfaced online thanks to online reports. Most of the new Dark Souls 3 details that have emerged today are on items, weapons and armor pieces. Some new details have also emerged on the Faran’s Undead Legion, which seems to share some sort of connection with Dark Souls’ Artorias, some NPCs, Weapon Arts and more. Reddit user Laf1 has provided a translation from the most recent reports from the event, and you can find it right below. About the shrine, It is already well said that I could confirm 5 NPCs:Fire Keeper, Andre, Merchant, Hawkwood, and the midget with the crown. During loading, it showed the item “Drilling furnace,” which is explained that the midget will give you special weapons or magics if you hand in to him, so to speak that it is possible to consider the midget is a trader. According to Hawkwood, he’s planning to bring the old lords of cinder to the throne of the shrine to reestablish the succession of linking the Fire. FYI, by killing the midget, you can get the ring that implies it has the same effect of the Redeye Ring from DS2. About Faran’s Undead Legion, The explanation of its armor says, “divided the blood of the wolf” and “Undead Legion is organized to watch the abyss.” Since their weapon is somewhat similar to Greatsword of Artorias, they might be related to Artorias. 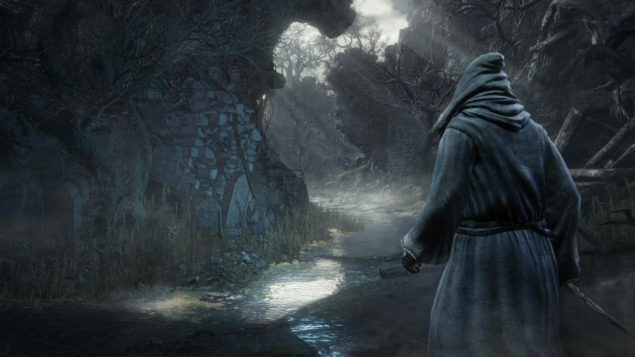 Dark Souls 3 launches next month on PlayStation 4 and Xbox One. The game will be released in April in North America and Europe on consoles as well as on PC.